This has been a particularly rough week. I’ve been working my tail off this week, doing volunteer stuff for 2 quilting guilds. By Friday night, I was nearly in tears. I was so dog gone tired and my body hurt all over. So, in spite of how busy I know I am right now, I decided to take a break. I used to live in a small town in Indiana. I loved living in the small town, away from the hustle and bustle and rat race of busy city life. We moved to the Kansas City area 3 years ago to be near family, and we moved into a house that is far enough out from the city for me to be okay and close enough in to the city for my husband to be okay. So… my way of taking a break yesterday was to get far enough away from the city to feel like I am in another world. 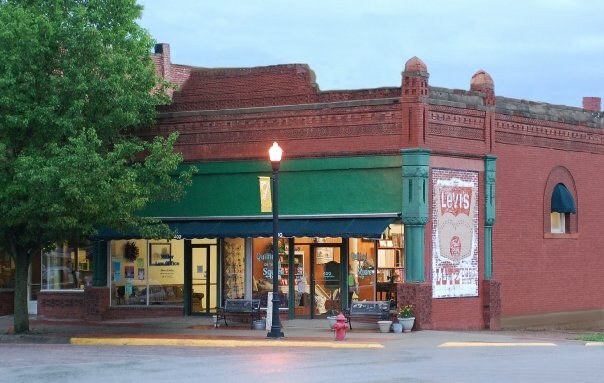 Have you ever been to Quilting on the Square in Holton, Kansas? I have been meaning to get there, but never had. Yesterday I got there. Quilting on the Square is a quilt store that is located on the corner of Holton’s town square. Holton is a charming little town that is like being in fairy tale world of days gone past. It’s close enough to Topeka, but it is far enough out to have that small town feel. Mark and Mary Pfeiler, Quilting on the Square’s owners, took me on a tour of their newly extended store. They also showed off their new room for their longarm quilting machine and business – I was envious! For whatever reason, I was transported into another world as I gazed open-mouth like a child in a candy store at their fabrics, etc. They have it all arranged so colorfully well, that you feel like you are having an out of body experience as you put bolt of bolt of fabric on the counter to be cut and taken home. There were so many fabrics that I love. I don’t know what happened, but I left there with more fabric than I think I’ve bought in the last year. But, you know what? As I drove home, I was at peace. I was at peace with what I’d spent, and I was at peace with the shared experience with Mary, Mark, and their assistants. If you haven’t been there, you need to go!!! I warn you, though, to take your SUV, van or truck, your debit card and credit card and all the cash you can stash. You’ll be glad you did. Do you know who Hollis Chatelain is? it is the best isn’t it. LOVE Quilting on the Square! What I like about the place is how friendly everyone is. No one hurries you and they are always willing to help you in your fabric selections. I love to see all the quilting projects they have finished or are working on. Yes, I have been to Quilting on the Square many times. I am a quilter/longarmer and I live in Topeka, KS and it is such a cute shop. They also have quilt bus tours now and then and they are alot of fun also. Everyone should put this shop on their bucket list!